It's Anchors Away with these easily customized nautical bridal shower invitations. They are professionally designed by the indie artists on Zazzle. Nautical-themed wedding stationery has some common elements. Blue stripes or chevrons appear on most of them. They are used as background elements or to frame the bridal shower details. Anchors, sailboats, ropes and liferings are also popular embellishments. There is a distinct difference between a nautical-style invitation and a beach-style invitation. Nautical style relates to boats and boating and the life of a mariner. It really isn't about seashells and starfish. Every nautical bridal shower invitation shown here can be easily customized. Zazzle artist Miss Tallulah gives you two choices. You can either choose the 5" x 7" bridal shower invitation with the bridal shower details on the front or you can opt for a square version that shows shows the decorative top on the front. Both designs feature a navy blue anchor surrounded by rope. There's a very cute lime green heart in the top of the anchor. A lime green banner runs across the center of the anchor and reads Bridal Shower. Navy blue and white stripes provide the background for the top half of the anchor and rope circle. A plain navy blue background covers the remainder of the bridal invitations. Note the wave pattern on the top of the navy blue. This charming sailboat and polka dot nautical bridal invitation comes from Zazzle indie artist All Pets Cherished. It's colorful and very patriotic. Tiny white polka dots frame the invitation. Choose either true red or light ocean blue. There's an anchor into the top right corner, a colorful sailboat in the bottom right corner and a life preserver in the bottom left. A bride who loves to sail will feel right at home with this bridal invitation. Her name is in a pretty red script. The rest of the bridal shower details are in simple script. It does mention a bridal cruise, of course you can easily and quickly use the template to customize it. Lighthouses have save many a sailor's life. Fabled lighthouse keepers were known to go to great lengths to keep the light bright during all kinds of storms. Many couples love visiting lighthouses and collecting memorabilia. Zazzle artist Print Creek Studio has created a beautiful lighthouse-themed bridal shower invitation. You can choose it in either blue or teal. The lighthouse forms the right border of the invitation. You can also see the ocean which provides a beautiful texture. Print Creek Studio chose to use a black font, which makes it very easy to read. 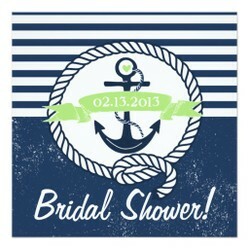 Perfect shower invitation for a maritime wedding. Classic nautical style has always been associated with the patriotic red, white and blue combination. This clean bridal shower invitation shows it off to perfection. Perfect for a Jack and Jill or couple shower. A blue sailboat tops the couple shower details. Both the bride and groom names are in red script. It's framed with a navy blue border. Don't miss the life-preserver, red and white detail that edges the inside of the border. The dog-eared corners of the rectangle containing the bridal shower information are the graphic design element that adds a touch of Art Deco glamour to this nautical bridal shower invitation. The navy blue background stripes combine with the anchor to make it more nautical than Art Deco. The script font gives it a breezy flair. Pink sailboat sails, stripes and ribbons all give these bridal shower invitations an very feminine nautical vibe. Designed by Invitation_Republic, the splashes of pink are balanced with navy blue and white. Unique soft shape makes it even more interesting. Is the bride a naval officer? She doesn't have to be to love this elegant and sophisticated design, but if she is, this is the design for her. The matte and shiny stripes make great contrast. The anchor is also in silver tone. Now that I look at your avatar, I think you are quite right! I really love the amazing selection of designs that you can find at zazle. No matter what theme, or type of item you are interested in, there's always a ton to choose from. These nautical bridal shower invitations are right up my alley!